When I get sad, depressed, frustrated, or upset I do two things. I go for a run, and I play in the kitchen, not necessarily in that order. In fact, usually not in that order; I generally will make something sugary and carby and delicious, and then go for a run to get rid of it. Eh, I’m okay with that. At any rate, yesterday was cheesecake day. I don’t have a spring-form pan, but I do have muffin tins and a recipe that calls for Vanilla Wafer crust cheesecake-cupcakes. Sold. These are deliciously light and fluffy, a cinch to whip up, and look absolutely stunning. I will be making them over and over (and over and over). I used Neufchatel cheese instead of cream cheese because it has a slightly lower fat and calorie content, but all the same goodness. I’m sure this recipe would work equally well with cream cheese, however. Line cupcake tin with cupcake papers–I used the foil ones because this is a pretty dense cake and I didn’t want the papers to get all soggy and gross–and crush 2 vanilla wafers in each cup. They don’t need to be powdered or anything, just break them up a bit. Set aside. 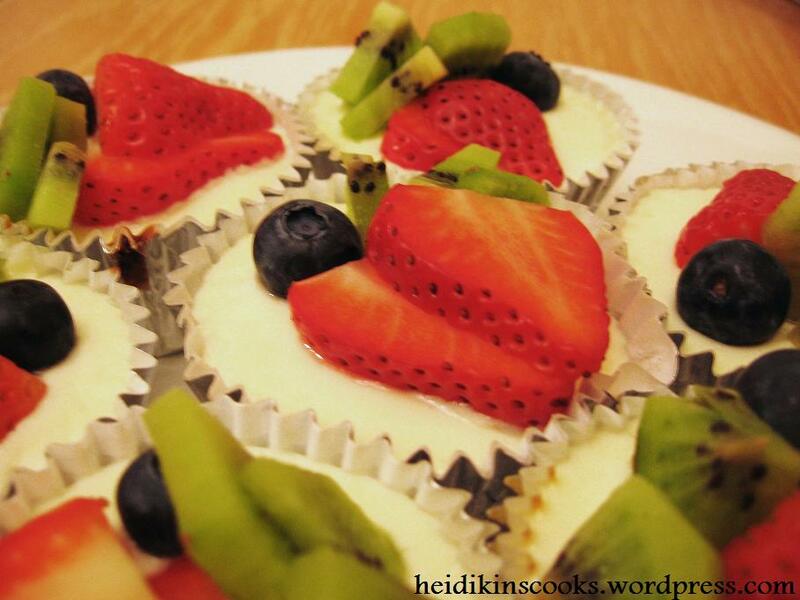 (Recipe makes about 18 cheesecakes). Whip Neufchatel cheese until fluffy in electric mixer. Add eggs, lemon juice and vanilla and stir to combine. Fill muffin tins 2/3 full and bake 15 minutes. Turn oven down to 300′. Whip sour cream, sugar and vanilla together. Spoon mixture on top of baked cheesecake and return to oven (now at 300′) for 5 minutes. Top with fruit or chocolate or both, keep in refrigerator until ready to serve. Well, hello, new friends. I’ll be sure to invite them over soon.